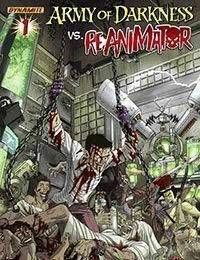 The Army of Darkness story that features the crossover no one ever expected to see: Army of Darkness vs. Re-Animator! Ash Vs. West! The Ultimate battle! Ash finds himself committed to Arkham Asylum, and its here that he runs afoul of a rather ghoulish and creepy Dr. Herbert West, Re-Animator! This book features the four issues of the titanic team-up, as well as a complete cover gallery (J.G. Jones, Sanford Greene, Gabriele DellOtto) and a Nick Bradshaw Monster Gallery Sketchbook! Two covers shipping in equal ratio featuring J.G. Jones and and Gabriele DellOtto!